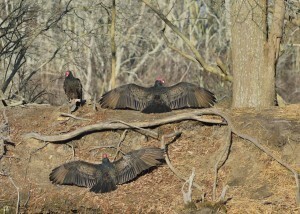 Vultures can be repelled around the home using a mechanical devices which will frighten them from the area. For use on the average roof top, we have a few “scare” type products which seem to bother them enough to make them move away. 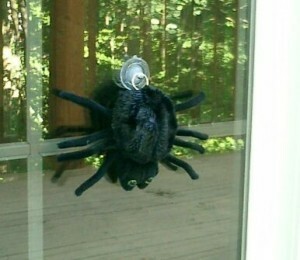 The first is the JUMPING ATTACK SPIDER. So if have them landing on gutters, TV antennas, electric lines or other movable parts of your roof, install one spider for every 400 sq/ft of area with activity. This device has a built-in sensor and can detect any kind of vibration or motion which causes it to release over 2 feet of string. It then retrieves itself back up by slowly winding up the string and moving its legs all the while. This motion mimics a real spider and is alarming to any bird including vultures. If the vultures are using a large area of the roof or if they’re roosting in trees adjacent to your home, install our ULTRA SOUND AUDIBLE ALARM where they’re active. These devices sends out a stressful range of ultra sounds vultures do not like. They can also send out an audible sound (you control the volume) as well as flash a strong LED light bar. 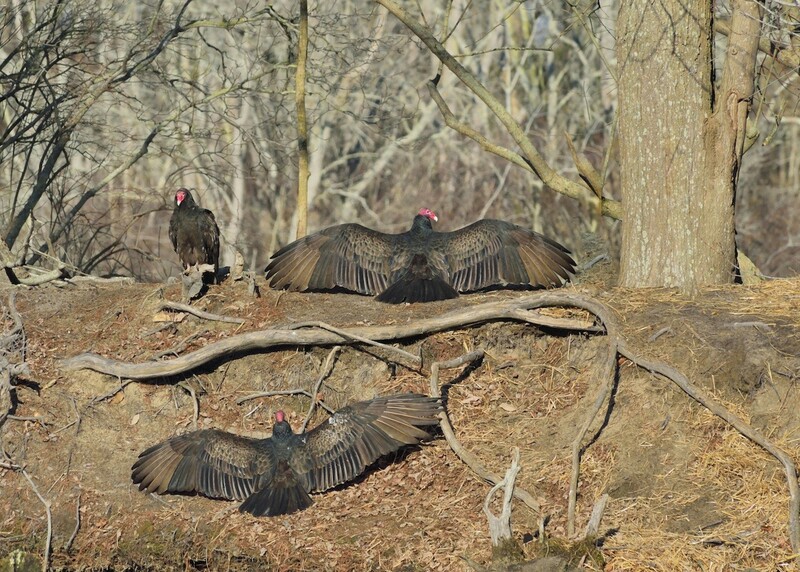 Activated by a motion sensor, these units can protect up to several thousand square feet and will keep vultures away. Sound Repellers are ideally suited for large open roof tops, power lines and open trees used for perching birds. They will send an ultra sound wave effective up to 75 feet away and their coverage can be up to 5,000 sq/ft. On the roof, you’ll want to position them in corners facing out over the area you want to protect. For trees and property borders, mount them on poles point up toward the place where they congregate. 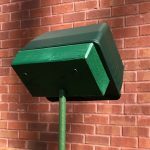 Our MOUNTING BLOCKS are well suited for the task allowing for easy installations pointing up anywhere you can place a 1/2″ stake. 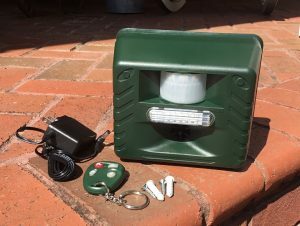 Each unit comes with a power supply and remote control wireless “key” so you can disarm the unit as needed or activate it if animals are close by but not close enough to set it off. These come with a wide range of settings but for vultures, you can set them to be active 24 hours a day and to set off when motion is detected. This means if birds come within 30 feet of the unit on the front side, they’ll be detected so the unit will sound for 20 seconds. Be sure to set the sensitivity to 30 and the audible sound to 60-80. The frequency setting should be right in the middle. For low lying vultures around ground level, install MOTION ACTIVATED WATER SPRAYERS. These devices have built-in motion sensors and when activated will release a blast of water which can be set to spray as powerful as your garden hose will allow. These devices will generally spray at least 25 ft or more and it only takes one blast to chase away unwanted vultures from the covered zone. Depending on the layout of your land, it will probably take 1 to 3 units to get complete coverage and protection. Place the unit at least 20 feet from the problem area and activate it a few times to see the spray so it can be adjusted as needed. You can actually hook them in series so several can be powered by one water source enabling you to protect an area several hundred feet from the home. Overall this device is highly effective and will yield instant results.